Congratulations to Zenju Earthlyn Manuel who just returned from the Buddhist Film Festival Europe held in Amsterdam. Zenju's Path, a documentary film directed by Kathryn Golden, was included in the festival. As the title suggests, this film chronicles..."the life & work of Zenju Earthlyn Manuel one of the first African-American female Soto Zen priest in the United States." Included in the film is a clip of the concert Sisthas of the Drum produced on May 23, 2010 which apparently was a hit with the audience. Thank you for the work you are doing in the world Zenju and for spreading our musical offerings to many cultures. Welcome Amsterdam readers! We appreciate you. We are students and teachers, listeners and communicators, consumers and creators, protectors and nurturers, friends and lovers. We drum from the heart, for the heart, to the heart and with our heart. 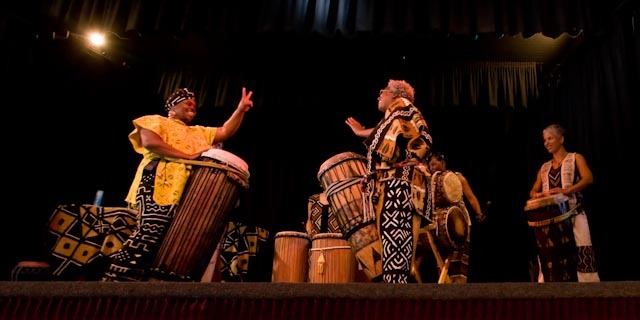 Absorbing the teachings of West African rhythms, songs and dances, Sistahs of the Drum respectfully represent the essence of our traditional African roots in harmony with our African-American cultural rearing. The resulting sound is from somewhere deep within; playing through us and resonating with you. Current members : Mar Stevens, Sandy Mills, Charlene Gumbs, Cynthia Lewis, Shawn Nealy, La Tanya Carmical and Salina Gray. Founding members : Zenju Earthlyn Manuel and Simbwala Schultz. Former members: Micia Mosely, Angela Niles, Rosetta Saunders and Rashida McKinzie. To Contact the group about how our drumming can support your event, please click on "view complete profile." Thank you for your vision and inspiration.